What is the first common thought in our minds about marble; a quick answer would be on its glossy finishing and luxurious look after polishing. Most of us are familiar with marble but are not aware on the risk of ignoring marble maintenance which can lead to high cost in the end. Marble finishes must not be taken for granted and we must not forget to be maintaining and polishing them. Marble is commonly used at countertops, bathrooms, walls and floors. The shining marble look can simply be achieved by constant polishing. Marble is the best option for the premise owner who wants to portray an expensive and classy look. However, installing marble floors in your workplace would require specialized maintenance on a regular basis. For that purpose, you should consult a marble flooring polishing professional with better ideas to prevent the marble floor from spoiled, ruined and damaged. You might dream of an impressive Italian renaissance style usually associated to that of the king’s palace with exclusive silver and gold marbles upon the pavement of floors and pillars in your premises or offices. However, your budget might not attain such marvellous marble floors unless you polished that plain looking marble into something great. 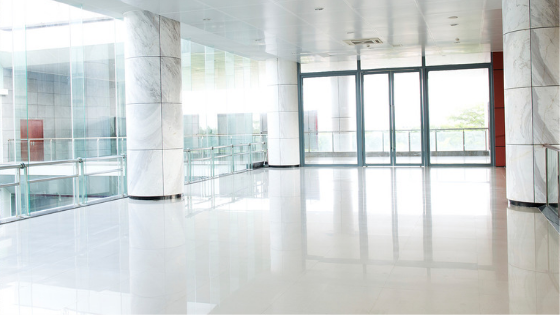 Over a long period of time without regular maintenance, marble floors look dull, dirty and worse still, they would look horrendous and give an impactful negative impression to the public especially at high traffic business premises. Polishing these marbles can enhance its decorative look for a sustainable, long lasting, economical and dust free marble finishing. We surely do want to have slippery and unmaintained floors in the offices or other premises that can cause injury and fall incidents to clients, employees and guests. Polished marble floors exuberate an expensive taste and they resemble stability, well established and solid business. People would definitely find it attractive in buildings such as hotels, shopping malls and banking, etc. Whether as a business owner or landlord of commercial buildings, a good image is everything when it comes to property market value. Resealing, polishing and restoring marble floors either indoors or exteriors could add up to a few thousands or even million Dollar of values of the property if it is sold. Attractive and newly high-quality looking marble floors are the main selling points that eventually increase the resale value and gain quick wins selling on the marketplace. The unique marble floor attributes such as lobby floors will give off the reflective shining effect that could seemingly make your main entrance to appear larger than it is. Marble floors are scratch resistant, and it creates aesthetic impacts on the interior and exterior of a building that would increase the marketable value of the property. Besides that, hygiene benefits one’s health and impacts the lives of those around the person, thus a clean bathroom can keep hotel guests happy and productive whereas, a slimy and grimy bathroom might turn off anyone. The best way is to start off by restoring the tile grouts, clean the stubborn dirt and polish the marble throughout the bathroom. Any investors, clients or guests entice further to buy the property and hugely impressed to building that looks good as new and properly maintained. The etch is like a scratch but not a stain. The etch is an actual changing of marble stone that leads to a dulling white mark surface. The etch mark shows like a ring round shape that seems like a glass of acidic liquid which was spilt in tiny spots. Most people might mistakenly assume that those dull white marks are watermarks. The etch marks are caused by an alkaline or acidic material when comes in contact on the marble floor surface. Naturally, the marble is a soft stone that is prone to marking upon contacts with acids which creates dull spots and corrodes small bits of surfaces. For instance, these acid or alkaline substances which are derived from food and beverages such as splashes of tomato sauce or lemon juice and even cleaning agent’s products are going to leave subtle marks on the marble surfaces. The marble polishing professionals have the best equipment like diamond abrasives that will ensure to beautify the etch marks to be polished and good as new. The experts have the experience to prevent further damage to the marble floor surfaces. The marble is made up of calcium bicarbonate and it is sensitive upon contact to acidic and alkali materials. The marble polishing experts must ensure that they are using the right equipment and effective cleaning agent chemicals to prevent such adverse reactions because harsh cleaning agents can damage these durable marble surfaces. Some marble stains can be easily removed while others can be challenging to remove it. The gouts and rusts are an example of stains that are impossible to remove and could be very stubborn. The marble polishing professionals can polish the stubborn stains completely with ease. They also can help to fix existing damaged marble surfaces and even marble surfaces on old buildings. The cleaning experts have in-depth knowledge to repair etched or chipped surfaces into shiny polished marble rather than be done by amateurs like us. Most landlords and business owners find a way to save money by trying to do marble polishing cleaning by themselves instead of hiring experts to do the work. However, they will regret doing it by themselves because the cost of making such mistakes can be damaging to the premises and incur more cost to repair the marbles back. The professionals have sets of skills to protect the marble from further damage and maintain it in a first-class condition which could last for many years. The experts used proprietary polishes that contain protective ingredients to care the marble and saves up more time and effort compared to doing by the owners themselves. Atalian Global Services provides cleaning services on marble polishing and dedicated to make old or plain marble floors look brand new. We offer floor polishing on marbles surface and maintenance of your premises, factories, apartments and workplace, etc. Atalian offers the best marble polishing service that is tailored to your specific needs and provides a suited package for you. Do contact us for a free consultation today for more information about our services.